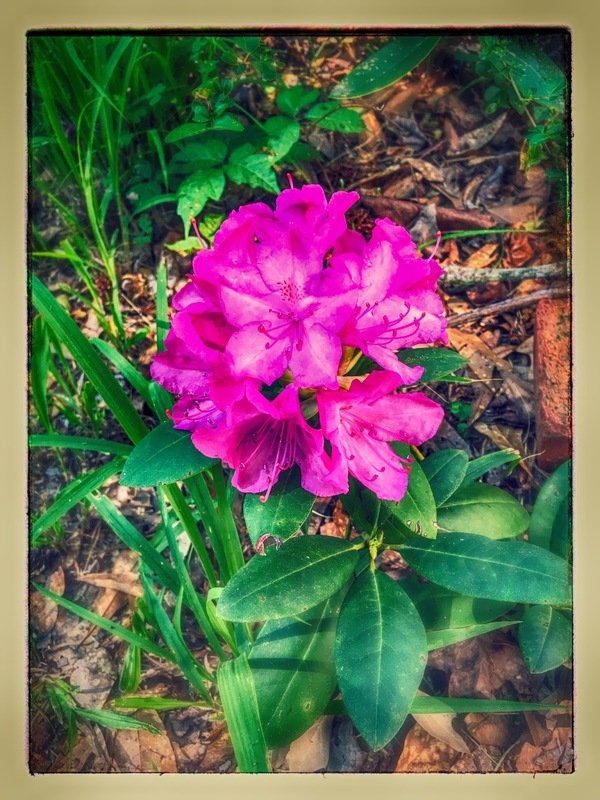 Jilda wrote about our rhododendron a few nights ago. The drought last summer and fall almost did it in. The plant was once almost as tall as our house, but it died down almost to the roots. Thankfully, I'd learned how the plant propagates and had gotten a young one started a few years ago. Even though we watered the plant when it was dry, it went into shock and dropped all the leaves except the ones on the very bottom. This spring, I had my fingers crossed that it would come back. The top part of it was dead, but new limbs sprouted from the lower limbs and the younger plan survived too. When the blossoms came out several days ago, we both breathed a sigh of relief. I'd forgotten how we came to own a plant that we both love. It was a gift from my mom. Through the years, each time she'd ask me what I wanted for my birthday, I would tell here I wanted a shrub. We all had a good laugh at the running joke. But one year when I went to her house to get some birthday cake, she had a potted shrub on her porch. It was the rhododendron. Winter was tough on my rhodo too, just a few blossoms survived. Need to take a close look at the plant and add whatever additions it needs. The beautiful blooms will make you think of your mother each time you see them. Winter is usually tough on our plants too, but not because of drought, but freezing. I love the picture...makes me think...where there's a will there is a way! Very nice gift, the meaning and memories will last longer than the shrub, you have to love that.